Old Palm Golf Club recently held an inaugural Glow Ball golf event at the Golf Studio, and it drew an unexpectedly large crowd, especially for summer. Nearly 80 members played in the nighttime tournament, using glowing golf balls that could easily be seen in the dark. It was pure fun from the get-go, starting with cocktails and hors dâoeuvres. The novel, scramble- format event also served to officially welcome Old Palmâs new Director of Golf, Dan Terlescki. A nine-hole short course of Par 3s was set up for the event. 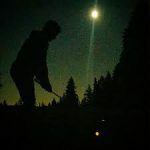 The holes ranged in length from 49 yards to 131 yards, a true test for even the most experienced golfers because they were playing in the dark. Even so, two foursomes came in at 3 under par. The champions were determined after a fiercely competitive, but incredibly fun chip-off.